Fuse accommodates a wide range of music tastes, while targeting a demographic of young adults between 18 and 34 years old. It also offers music content through its website, its video on demand service, and through its "Fuse Mobile" service. As of February 2015, Fuse is available to approximately 71,491,000 pay television households (61.4% of households with television) in the United States. The channel originally launched on July 1, 1994, as MuchMusic USA; it was originally founded as a joint venture between Cablevision and Toronto-based CHUM Limited. CHUM would later sell its 50% stake in the network to Cablevision, but allowed the continued use of the "MuchMusic" name under a brand licensing agreement. Initially, the network mirrored the schedule of its Canadian equivalent with U.S. advertising, but with French language programming and programs licensed from MTV and VH1 blacked out and replaced with either reruns of other programs or infomercials. By 2001, MuchMusic USA began to diverge from its Canadian parent; it introduced a new logo identifying itself as MMUSA, and began to air its own original programming and music video blocks, often featuring user-submitted videos. By December 2002, MMUSA had replaced almost the entirety of its schedule with domestically produced programming, with the only MuchMusic program remaining being RapCity. After CHUM revoked its licensing agreement for the U.S. channel to use the MuchMusic brand, Cablevision announced that it would relaunch MMUSA as Fuse in 2003. The channel officially relaunched as Fuse on May 19, 2003, with the debut of the critically acclaimed hip-hop comedy series Kung Faux. Fuse originally focused on more underground and indie music genres. Today, the channel focuses on a much broader range of music genres such as pop, urban, punk, and heavy metal while still encompassing underground indie music scenes and popular culture. In its early days, Fuse programming was also very music intensive. The network indirectly bashed MTV with a slogan touting Fuse as the channel "where the music went." Fuse's advertising in this period, by New York-based Amalgamated, generated controversy both through its more direct criticism of MTV, and through its parodies, particularly that of the iPod ad campaign. 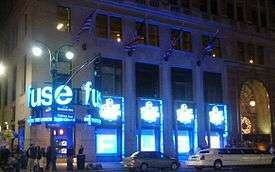 Viacom, corporate owner of MTV and for a short while the former owner of many of Fuse's current sister properties, protested when a Fuse billboard appeared across from its headquarters featuring Sally Struthers' plea to "save the music video." In 2008, Fuse became the exclusive television partner for some major music events, including signing a three-year deal to air the Rock and Roll Hall of Fame Induction Ceremony and the Bonnaroo Music and Arts Festival. Fuse also works with the Van's Warped Tour, Voodoo Experience, and Lollapalooza, airing interviews and live news from the festivals. The same year, as part of a corporate reorganization, Cablevision moved Fuse from its Rainbow Media division to its Madison Square Garden unit – aligning it with a group of co-owned music venues across New York City. In 2009, Fuse debuted a two-minute music news program called The Daily Noise which is updated courtesy of Billboard Magazine. In April 2010, Cablevision's MSG unit, including Fuse, was spun off as a separate publicly traded company, The Madison Square Garden Company. On June 20, 2010, Fuse simulcast the 2010 MuchMusic Video Awards, marking its first broadcast of MuchMusic programming since its relaunch as Fuse. Other MuchMusic programming would return in 2011, including The Wedge and Video on Trial (which would also gain an American version). Blink-182 and former +44 singer/bassist Mark Hoppus began hosting his own weekly television series on Fuse that year, titled Hoppus on Music. The show has featured a star-studded lineup of guests, including Alice Cooper, Rob Zombie, Foo Fighters, Kid Rock, Linkin Park, Snoop Dogg, Phil Collins, Ben Folds, Kid Cudi, Angels and Airwaves, Simple Plan and Ozzy Osbourne. On June 28, 2011, Vevo and Fuse entered into a video syndication and content partnership. As part of the partnership, Fuse.tv syndicates Vevo's music video and entertainment programming, including exclusive music video premieres, live music events, and originally produced series. September 11, 2009: Jay-Z concert live from Madison Square Garden. The concert was simulcast by MuchMusic in Canada. February 18, 2011: Linkin Park live from Madison Square Garden. August 30, 2011: Red Hot Chili Peppers from The Roxy Theatre in Hollywood. December 16, 2011: Swedish House Mafia live from Madison Square Garden. December 17, 2011: The National live from The Beacon Theatre. December 18, 2011: Z100's Jingle Ball 2011 live from Madison Square Garden. In the fall of 2012, Fuse refocused itself with a new on-air branding campaign designed by Loyalkaspar, and focused more of its website, fuse.tv, on trending music news stories. During music video programming, the channel runs a ticker which features the latest news stories from Fuse News and Twitter. That winter, Fuse launched a mobile app for Android and iOS devices. In November 2012, Fuse announced the launch of Fuse News, a daily news update program which debuted in February 2013, along with additional newsworthy programming including Trending 10. The channel continues to focus on music but has also diversified with reality shows such as Off Beat and Ex-wives of Rock. Top 100 Playlist aired in 2012 presenting various artists and bands. In March 2013, it was reported that MSG was planning to sell all or part of Fuse—the network had been struggling, and was facing growing competition from digital outlets such as Vevo. It was speculated that the network could be merged with either AXS TV—a network owned by a consortium headed by Mark Cuban, Anschutz Entertainment Group, and Ryan Seacrest, or Sean Combs's similar network, Revolt. On April 4, 2014, it was announced that SiTV Media, the parent company of the Latino-oriented entertainment network NuvoTV, would acquire Fuse for $226 million. SiTV outbid Revolt, who had made a $200 million offer to acquire Fuse. As part of the deal, the Madison Square Garden Company would take a 15% stake in SiTV. Prior to the official announcement, Benny Medina (manager of Jennifer Lopez, the network's chief creative officer) stated that if SiTV were to acquire Fuse, there were no immediate plans to make any major changes to the network's programming, emphasizing that Fuse and NuvoTV would be "two different companies with two different identities, audiences and goals.". However, on May 1, Fuse News was cancelled with immediate effect, with the entire staff let go, along with other cuts throughout the network. The acquisition was completed on July 1, 2014. During Fuse Media's 2015 upfronts presentation in March 2016, it was announced that NuvoTV will be folded into Fuse, as the network begins expanding beyond music programming and introduces a new programming slate targeting "New Young Americans". Among the new shows announced was White Guy Talk Show, a late-night talk show hosted by Grace Parra and Saurin Choksi, which debuted on March 2, 2015; and, debuting on April 9, Skee TV, hosted by DJ Skee, featuring interviews and live performances. In addition, the newly rebranded parent company, Fuse Media, announced the launch of a new music channel focusing on "up-and-coming, young, diverse talent". The new channel, FM, would later launch on September 30, 2015, replacing NuvoTV. On April 7, 2015, it was announced that Fuse would be the exclusive broadcaster of the Legends Football League. Since then, Fuse has been in a case of channel drift by adding more movies, sitcoms, and reality shows to their schedule. On July 31, 2015, Fuse announced they would relaunch with a new logo and branding on September 30, 2015. In addition to new series such as Transcendent, which documents the lives of transgender women at AsiaSF Cabaret & Restaurant in San Francisco, and Revealed, which features music videos, interviews, and behind-the-scenes footage of artists at work, Fuse annonuced a multi-year partnership with comedian Gabriel Iglesias for additional new programming and comedy specials. ↑ "Fuse.tv — Music Videos and News, Free Downloads and Concerts". Fusemusic.com. Retrieved 2011-02-04. ↑ "Fuse on Demand". fuse.tv. Retrieved 2011-02-04. ↑ "Mobile Video and Text Alerts". Fuse.tv. Retrieved 2011-02-04. 1 2 "Fuse Media, Inc. unveils new ambitious original programming slate for Fuse network, expanding beyond music for 2015-16 season". Zap2it. 2015-03-04. Retrieved 2015-03-25. ↑ R. Thomas Umstead (March 4, 2015). "Upfronts 2015: Nuvo TV to Meld into Fuse in Q3". Multichannel News. NewBay Media. ↑ Mucha, Thomas (2005-03-01). "They Want Their Fuse TV - March 1, 2005". Money.cnn.com. Retrieved 2010-06-25. ↑ dabitch (2003-05-15). "Fuse is fuel for fury. MTV doesn't like their tone.". Adland.tv. Retrieved 2010-06-25. ↑ Tim Arango (2004-07-23). "Apple Blows Fuse Over Ads". NYPOST.com. Retrieved 2010-06-25. ↑ dabitch (2004-07-24). "Fuse parodies two campaigns in one - gets Apple on the phone". Adland.tv. Retrieved 2010-06-25. ↑ "Fuse Gets Rock Hall of Fame Telecasts In Three-Year Deal - 2008-11-03 06:00:00 | Multichannel News". Multichannel.com. Retrieved 2010-06-25. ↑ Riddell, Kelly (2010-02-10). "Cablevision Spins Off MSG to Focus on Cable Franchise". Bloomberg. Retrieved 18 January 2013. ↑ "CTV Media Site - MuchMusic". Ctvmedia.ca. 2010-06-08. Retrieved 2010-06-25. ↑ "Coming to Fuse This Fall: A Different Spin with Mark Hoppus". Fuse.tv. 2010-06-22. Retrieved 2010-06-22. ↑ "Fuse Announces New Weekly Show 'Hoppus on Music'". PR Newswire. 2010-06-22. Retrieved 2010-06-22. ↑ "VEVO Press Release Media Site - Fuse". Fuse.tv. 2011-06-28. Retrieved 2011-07-18. ↑ "CTV Media Site - MuchMusic". Ctvmedia.ca. 2009-09-08. Retrieved 2011-02-04. ↑ "Fuse presents "Drake: Live From Radio City Music Hall" Nov. 24 Media Site = Channel Guide Magazine". channelguidemagblog.com. 2010-11-19. Retrieved 2011-07-18. ↑ "Fuse presents "Elton John and Leon Russell Live From the Beacon Theatre" Oct. 19 Media Site = Channel Guide Magazine". channelguidemagblog.com. 2010-10-15. Retrieved 2011-07-18. ↑ "Linkin Park Live MSG Concert on Fuse Presents, Friday February 18". www.zimbio.com. Retrieved 2011-07-18. ↑ "Fuse Presents Red Hot Chili Peppers Live from The Roxy". www.theaudioperv.com. Retrieved 2011-09-11. ↑ Itzkoff, Dave (September 4, 2012). "Fuse Introduces 'Fuse News,' with Some Recognizable Hosts". The New York Times. Retrieved 2013-12-18. ↑ Atkinson, Claire (2013-03-22). "MSG could be at the end of its Fuse". The New York Post. Retrieved 2013-12-18. 1 2 "Confirmed: Fuse Will Go to J. Lo's NUVOtv Parent Company SiTV". Billboard. Retrieved 23 April 2014. ↑ Liberman, David (April 2014). "JLo Outbids Sean Combs for Fuse TV; Snaps Up for $226 million". Deadline.com. Retrieved 2014-04-05. ↑ Charlton, Jordan (1 May 2014). "The Ticker: Fuse, Oliver, Tapper". TVNewser. Retrieved 2 May 2014. ↑ Staff, Report (1 May 2014). "Fuse Readies For NuvoTV Merger By Shedding Some Staff". Deadline.com. Retrieved 2 May 2014. ↑ "NUVOtv PARENT COMPANY SÍTV MEDIA COMPLETES ACQUISITION OF FUSE NETWORK FROM THE MADISON SQUARE GARDEN COMPANY" (PDF). Retrieved 2014-01-07. ↑ "'White Guy Talk Show' & DJ Skee-Hosted Series On Fuse Media's 2015 Slate". Retrieved 2015-03-25. ↑ "Upfronts 2015: Nuvo TV to Meld into Fuse in Q3". Multichannel News. Retrieved 2015-03-25. ↑ "Hilary Ready to Light Up a New 'Fuse'". Multichannel News. Retrieved 2015-10-01. ↑ "FOOTBALL SEASON RETURNS WITH THE GRIDIRON GODDESSES OF THE LFL ON FUSE". Fuse Media. Retrieved 2015-04-07. ↑ "Fuse TV to relaunch with new identity, programming". Rapid TV News. 2015-08-01. ↑ Khatchatourian, Maane (2015-07-31). "Fuse TV to relaunch with new identity, programming". Variety. ↑ "FUSE RELAUNCHES ON SEPTEMBER 30th WITH NEW NETWORK BRAND AND PROGRAMMING". Fuse Media. Retrieved 2015-08-06. ↑ "Fuse: Fall 2015 - New Network Brand". Retrieved 2015-10-01. 1 2 "Meet Our 'Got Ur #' Host, Timothy Dunn". fuse.tv. Retrieved 2015-05-09. ↑ "Alexa Chung's American Fuse News TV Show - Brad Pitt's Second Chanel No.5 Video Ad". ELLE. Retrieved 2013-12-18.